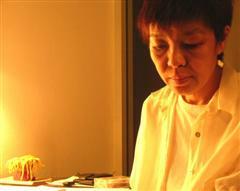 Araya Rasdjarmrearnsook is the foremost female artist in Thailand. Her joint exhibit with the late Montien Boonma at this year’s Venice Biennale has garnered both praise and controversy for her employment of real human corpses. But this is no black-garbed goth  the 47-year old art teacher at Chiang Mai University has the soft disposition and easy laugh of a schoolgirl. Her treatment of death is one of the most touching and compassionate in modern art, and it is made all the more poignant by both Thailand’s recent tsunami catastrophe and the grand, crumbling backdrop of Venice itself. Q: Why did you choose death as a subject for your art? Q: As play, then, do you feel that your art celebrates death? A: It depends on the perception of the viewer because every group has their own concepts and beliefs. It makes them focus on this topic more than they are used to. I’m not trying to provide a judgment about death, just to present it for consideration. Q: You said the disaster of a mass death, like a Tsunami deprives the victim of a kind of dignity. A: Death can have a type of charm. In a situation like a Tsunami, the images are too clear. When we see images of death like that it has no secret anymore. It loses its charm. Q: What do you mean when you say death has charm? A: Maybe living is not so beautiful for every person. Maybe death is charming for some people. I have two people who work for me and take care of my dogs when I’m away. When I came back from Venice I found one of them was in the hospital. He died a few days later. He was 29 years old. But I think it was so beautiful. By this age a person is not so greedy, so consumed. He died before he could become harder. He had a nice experience in his life. He was strong and active. It may be okay to die young. Q: What brought you to be so interested in death? A: My mother died when I was three years old. From three to six years old I participated in many funerals. So many for such a young girl. My great grandmother, my grandmother, my mother. My mother was pregnant and my father helped deliver my baby sister. He was a physician. But my mother died in childbirth, and then my younger sister died a week afterward. Too many funerals I think. Then my stepsister died at one and a half years old. From this reason, I guess, I have been interested in examining death. Q: Through exploring death through art have your opinions or feelings changed about the subject? A: Yes! I don’t want to go to funerals any more! (laughs) When I was young I studied at Silapakorn University in Bangkok and I loved to go to funerals. I loved to go to see the ceremony, many flowers, all the people dressed in black. It was beautiful. Now, after working on this project I don’t really like it anymore. I’m tired of death! May be too much. Q: In the west we’re pretty closed about death. We don’t like to talk about it. Is Thai society the same or is it more open? A: More open. Because of Buddhism. We are taught that there are three steps of life. Birth, Getting older and then Death. Death is one of the steps. It is a part of life. Q: What do you think about the difference between how death is seen in Thailand and the West? A: A professor of philosophy in Stockholm told me that many people had died without seeing a dead body in their life. That’s the difference. Here sometimes I participate in a funeral in my village in Mae Rim. It’s very typical that they keep a dead body in their house before they burn it. Normally they keep it on ice between 3 to 9 days. They are dressed in their most beautiful clothes. Q: Everyone does this in Thailand? Q: Far fewer people died in the September 11th attack in the US than they did in the tsunami here. And we still talk about it all the time. But here in Thailand, only a few months afterward, it seems as if everyone has already forgotten about it. What do you attribute this to? A: Most people say that Thai people forget easily. They feel excited for a short time and then after that they forget. This is a culture of sanuk [fun]. Q: So the most important thing is to have fun and be happy? A: I don’t know if it’s always real or not but you feel that you have more confidence if you are seen as a happy person. It gives you more confidence in the group. Many young artists and art students follow this way. They think: why should we act very serious? Why don’t we make art for happiness? For sanuk? Q: It seems many western artists believe that if they aren’t serious they won’t be taken seriously. Which may be why politics plays such an important part in western contemporary art. A: I think is comes from cultural character. Thai artists at university don’t tend to be political like they are in the west. They normally go to nature, or to Buddhist philosophy for their inspiration. No one talks about minorities or hill tribes. I don’t know why. I think it’s not in the Thai character. They prefer to go the peaceful way. Q: You have a lot of experience with both western and eastern art. What are the particular strengths of Thai artists? A: Some Thai artists make art for two-way communication. I know one curator who said that Thai artists can do that kind of art very well  to open spaces for communication. I myself think that art can help Thai people to learn to be more individual. In our society, the group is always very powerful. It tends to orient people toward the power of quantity rather than individual quality. 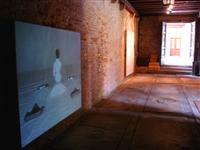 Q: After the Biennale is this exhibit over or will you show it elsewhere? A: I have been invited to Turin, Italy to do another version of “The Class.” But they have to get me corpses! They are working on getting them for me. Q: Were you afraid to be around the dead bodies? A: Yes. The first night before I thought about lying with the dead bodies I could not sleep. But I was so afraid already that when I finally lay next to them I was no longer afraid. I felt very comfortable. The only problem was that the filming took many hours and so the smell became very strong! Q: Did the Tsunami have any effect on the choice of the theme? A: No. It was already planned before that. Q: In Death Seminar you read a famous Thai book called Inao to the corpses. Does it have anything to do with death? A: No. It’s about a young king who has many women. He travels from town to town and has many fights and lovers  like a typical man! (laughs) It was composed by King Rama II. But it’s based on Javanese stories. One Thai man who studies in Hawaii who wrote about my work asked me why I chose to read Inao to the dead. I told him that everyone loves love stories  maybe even dead people! A: I am working on a video seminar about mad women. I participate in a group of twenty mentally ill women. Each one asks questions and another answers and the conversation goes into all different directions. At the end of the seminar we stand and sing the Thai national anthem! Q: You are also quite famous as a writer. What kind of stories do you write? A: My first book was about oriental women in which I compared the western and the eastern roles for women. At the time I was studying in Germany so I had some experience in both situations. The second one is about lust  the need to have others in your life and the conflict that results. The third one is called “I Am an Artist.” [Pom Pen Silipin] But I use the male pronoun “pom” instead of the female “dichan.” Through this story I can allow myself to be very aggressive by using this pronoun. 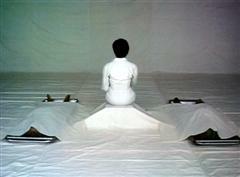 Q: So do you feel that people in Thailand look differently at woman artists and man artists? Are you often disadvantaged by others for being a woman? A: Among art academies and art circles in Thailand, my feeling is that people believe more in male artists than women. For example, once I heard from an art history professor that he didn’t want to put female artists in his class because then everyone would get married and they wouldn’t be interested in art any more. Q: Speaking of teachers, it was quite funny the way you parody academia in your video installation “The Class” by getting up in front of a blackboard and teaching the dead about death. But you are a teacher yourself. Are you making fun of yourself as a teacher? A: I think yes. One art critic, Geeta Kapur came to an opening and saw “The Class” and asked me if I wasn’t also speaking to myself. I said yes, I was. Q: Which writers or artists inspire you the most? A: Writers more than artists. Mostly the old fashioned ones. Like Herman Hesse, Gabriel Garcia Marquez and Antoine St. Exupery. But not artists so much. Once I saw a very good piece of art by Hans Haacke in a sculpture project in Muenster, Germany. I cried when I saw his piece. But after that when I saw a different piece by him I didn’t have the same feeling. His work changed. Art is less consistent than writing. And most writers that I like are already dead so their work doesn’t change. Q: Like the twenty-nine year old caretaker of your dogs. He died before he could change, maybe for the worse. Do you feel that there is a kind of enviable integrity in the life of someone who is no longer alive? A: Yes, but at the same time, I can not fault people for changing. I know that I still want to change myself! Q: At the end of “The Class” you discuss your own death. You say that you would like it to be like Antoine St. Exupery  the famous expert pilot and writer who just disappeared one day, never to be seen again. So I guess that means you don’t want to have a big Thai-style funeral? A: No. (laughs) I already have my grave reserved in my own garden. It is the rainy season now and my grave is like a small pond, reflecting the stars.